It is the mission of the Paducah Police Department to enhance the quality of life in the community by working with our partners to fairly enforce the laws, preserve the peace, reduce fear, and provide a safe environment for the citizens and visitors that we serve. The Paducah Police Department strives to maintain the highest standards of excellence utilizing leadership, training, and technology to create a safe environment for citizens and continue as a national leader in law enforcement. The Paducah Police Department emphasizes the values of professionalism, respect, accountability, integrity and communication with all of our employees as we strive for excellence and continuous improvement. PROFESSIONALISM: We will demonstrate professionalism through the pursuit of the policing mission with moral and physical courage, composure, competence, and respect in a manner that upholds the highest standard of policing ethics, displays a commitment to continual self-improvement, and generates public trust, respect, and confidence. ACCOUNTABILITY: We will be held accountable for our actions, our behavior and our performance by the department, its members and the community we proudly serve. INTEGRITY: We will be honorable, ethical and honest in our daily interaction with the department, its members and the community we proudly serve. The Administration Division oversees the department's day-to-day operations. It is comprised of the Chief of Police and his assistant; the Office of Professional Standards; Training; and Community Resources. This division is responsible for budget, personnel, accreditation, internal affairs, policy review and all departmental training. It also includes the new Community Resource Officer (CRO) position, designed to be a liaison between the department and the community’s schools, groups and organizations. The CRO also is responsible for the department’s Citizens’ Police Academy, Jr. CPA, Coffee with a Cop and Neighborhood Watch programs. The Operations Division often is referred to as the department's “backbone.” It is the most visible of the three divisions, with uniformed officers patrolling the streets in marked police cruisers. These officers annually answer tens of thousands of calls for service and perform preliminary investigations of all criminal activity. They conduct proactive patrols, investigate suspicious activity, enforce traffic laws and investigate thousands of traffic crashes each year. Within this division are several specialized units: K9 teams; Special Weapons and Tactics (SWAT) Team; Crisis Negotiation Team; Bomb Squad; Collision Reconstruction Team; Bike Patrol; and DARE or GREAT instructor. The Support Services Division is the department's investigative and record-keeping arm. 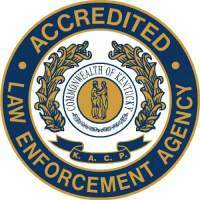 It is made up of three units: General Investigations, Drug and Vice Enforcement (DAVE) and Records and Evidence. General Investigations Unit detectives conduct in-depth investigations of major crimes – from forgery and fraud to computer crimes to arson and murder. The detectives of the DAVE Unit focus on illegal drug activity, including both street drugs and prescription drugs, and “vice” activities, such as prostitution. The Records and Evidence Unit maintains all the department’s records, including crime and vehicle collision reports, and logs and maintains the integrity of hundreds of pieces of evidence each month. The 911 Communications Services Division is the primary Public Safety Answering Point (PSAP), providing 911 emergency and non-emergency services to the 65,000 residents within the 251 square miles of McCracken County in Western Kentucky.